Specialized alloy steel construction males these hammers ideal even in the most abrasive applications. Used in many different industries and companies throughout the world. 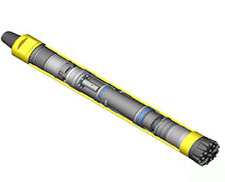 The “DTH hammer” or “Down-the-Hole” is used for drilling small or large holes through a wide range of rock types, the variety of DTH hammers continues to enhance well beyond the original conception of blast hole drilling. Increased efficiency with more power and consistent penetration rate.